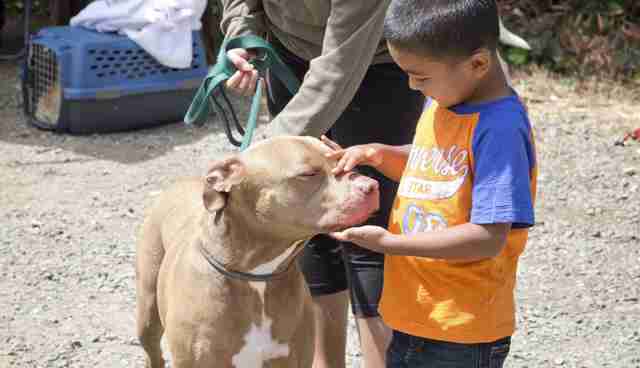 People Are Unfairly Forced To Leave Their Dogs At Shelters. Now There's Help. Veronica lives in a friend's garage. She's determined to keep her family together, but money is tight, and affordable rentals are excruciatingly hard to come by in the San Francisco Bay Area. 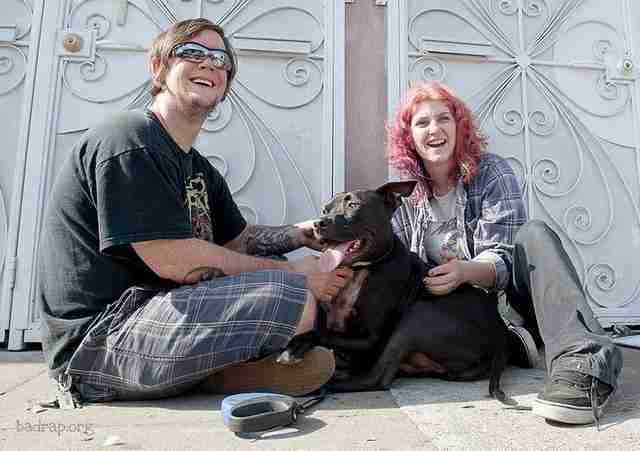 With two blocky-headed dogs in the equation, finding housing becomes nearly impossible. To make the search easier, she could surrender her pets to the city shelter - a notion, at this point, she can't bear to think about. But in a month, when her friend moves out and space in the garage is no longer available, Veronica, who is not pictured in this story and asked to be identified by her first name, may be forced to confront the unthinkable. Her predicament is hardly unique; in fact, it's surprisingly common in the Bay Area, where residents are still recovering from the recession, and pet-friendly, budget-friendly rentals don't become available often. Last year, sfgate.com reported that one local listing site claimed only 17 percent of their rental apartments specifically indicate that dogs are accepted. The result is that more and more pets are winding up in shelters - not because they're unwanted or unloved - but because their people literally can't provide a roof over their heads. 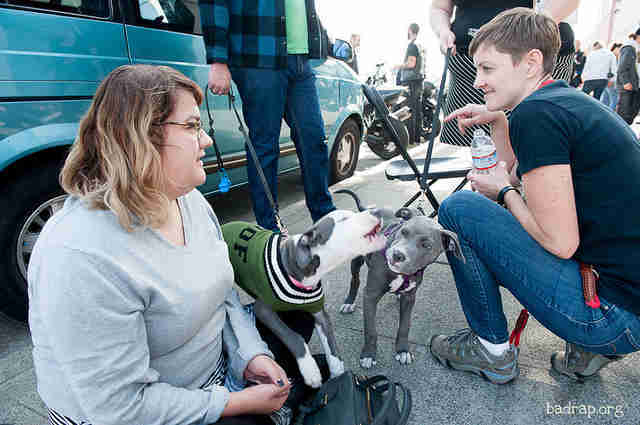 "The displacement of families and squeeze on renters has just wreaked havoc on shelter intake numbers," says Donna Reynolds, founder of rescue and advocacy organization for pit bull type dogs BADRAP, out of Oakland, California. "The housing shortage also impacts the number of adopters - renters - who can open their home to a sheltered dog, so it sabotages potential shelter adoptions as well." Reynolds says that this year alone BADRAP has already helped over 450 families, including Veronica's, through their Keep 'Em Home program, created expressly to address the current crisis. 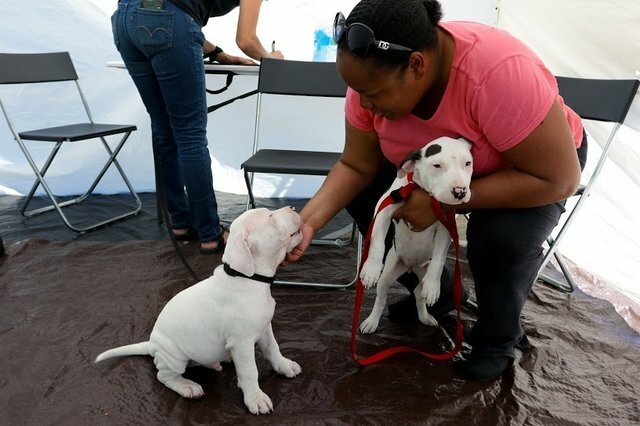 Support takes various forms, including providing free services like veterinary care, spay/neuter surgeries, and training and behavior counseling to help dogs put their best paw forward when meeting potential landlords. It can also mean temporary housing assistance - boarding dogs, paying for hotel rooms and matching homeless clients with willing landlords. "We see the Keep 'Em Home project as a bit of a life raft in a sea of bad funk," Reynolds explains. "Committed pet owners don't have to face heartbreaking situations alone." Owner support programs, now gaining recognition as an effective strategy in curbing shelter intake, are not without their critics. Even among some in the animal welfare community, there's an attitude that "if you can't afford pets, you shouldn't have them." Kim Wolf, executive director of the owner-resources focused group Beyond Breed, describes how that thinking is not only misguided, it fails to take into consideration the relief that many living below the poverty line are actually providing to shelters. 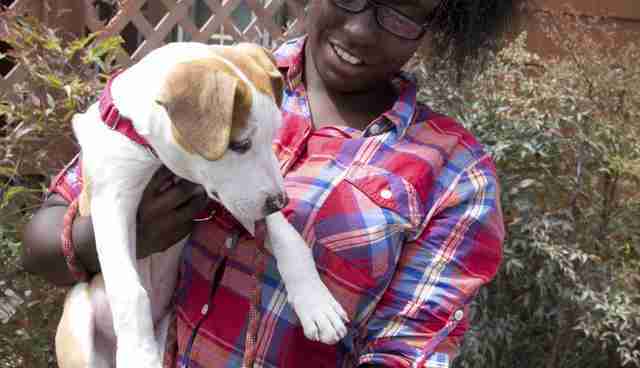 "There's a huge misconception about how people in underserved neighborhoods acquire pets," she says. "A lot of 'informal rescue' takes place, where individuals take in pets off the street or from previous owners who can't keep them. Many, if not most, of these pets never enter the shelter system and therefore are not captured in formal assessments of community needs." 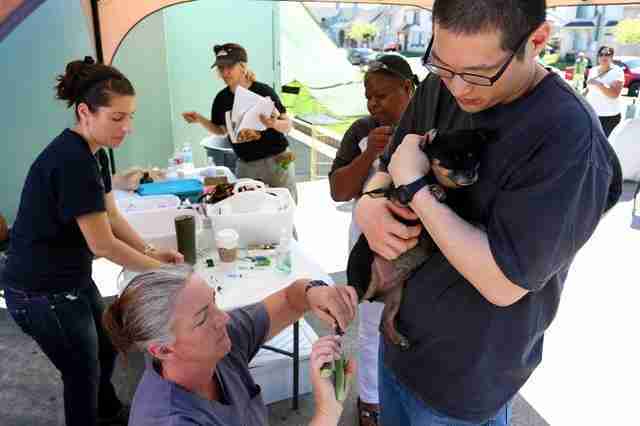 Wolf's organization operates Ruff Riders, a program that delivers pet food and supplies as well as helps underserved neighborhoods access and afford basic veterinary care and spay/neuter services out of Brooklyn, New York. And she stresses that shortages of resources, not misguided attitudes, are the biggest hurdles for the population Ruff Riders serves. "There's this mistaken notion that you have to beg or bribe people to do what's best for their pets. But in my experience, there are so many people who are thirsty for this support; the hard part is finding ways to keep up with the demand." That demand is not simply a matter of economics, according to Wolf. The reasons families or individuals might need a helping hand can be as varied and overlooked as they are indicative of the times. "Since our country is growing older, and in record numbers, we're seeing more older adults having difficulty walking safely in the community; when you add a leashed-dog or a cat carrier to the mix, a trip to the vet's office can be very difficult." For decades, much of the efforts to control shelter populations has focused on adoption and spay/neuter programs. The idea of building owner support programs into shelter programming, particularly in public municipal shelters, may take some convincing. Owner support may not be as initially attractive or flashy as adoption, and it's not as quantifiable as spay/neuter; in fact, it can feel clumsily amorphous. But its value can't be discounted, even if we're years away from perfecting it. 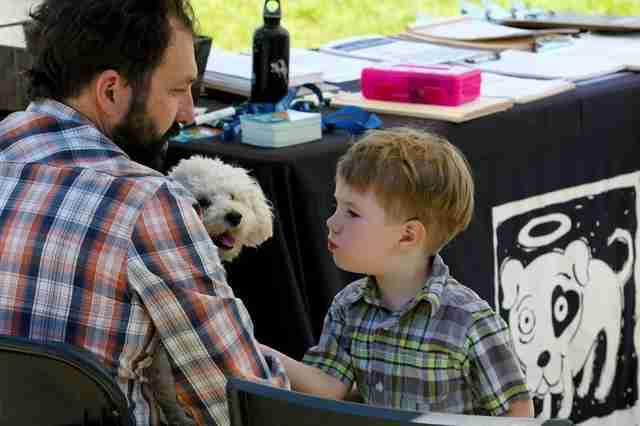 "While we work to help families navigate contemporary obstacles to keeping their dogs, we're also challenged to educate the wider community so they understand why shelters are so full," says Reynolds. "Many people's ideas are filtered through misconceptions and stereotypes about the dogs and, especially, their owners. Misidentifying the problems leads to ineffective solutions, and that hurts us all by wasting time and resources that could be put to work." Certainly there are those for whom owner support programs would not make a difference - people who simply no longer want their pets. Veronica isn't one of them. So she's relentlessly working - and seeking help from the right sources - to find housing that can accommodate her family and her budget. If there comes a time when she's forced to give up her dogs, it won't be for lack of trying or because she didn't care. She will have done everything she knew how to do. And then some.